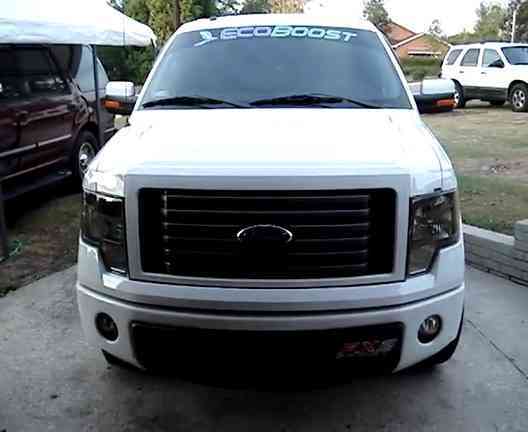 2011 LED Mirror Reflector Mod - Ford F150 Forums - Ford F-Series Truck Community. Hey guys, now please don't beat me up for doing this...If you don't like it just move on. It's all personal preference of course. Ok this mod applies to anyone with the integrated rear facing LED turn signals in the door mirrors. Now I can't understand why Ford put the front facing amber reflectors on our mirrors without making them signals for improved visibility... It would just make sense and add maybe $10 to the cost of the truck if it was done during production. Anyway, I made mine LED signals for less then $30 and IMO it looks really cool. First thing I did was buy these extremely bright SMD LED's from my Local Autozone. They are very thin and easy to work with. Next I popped the amber reflectors out of my mirrors which is very simple. Small screwdriver between the reflector and far side of the mirror (away from the truck) and they pop right out. Next I cut the LED strip at the first cut mark, which gives you three SMD LED's to mount. 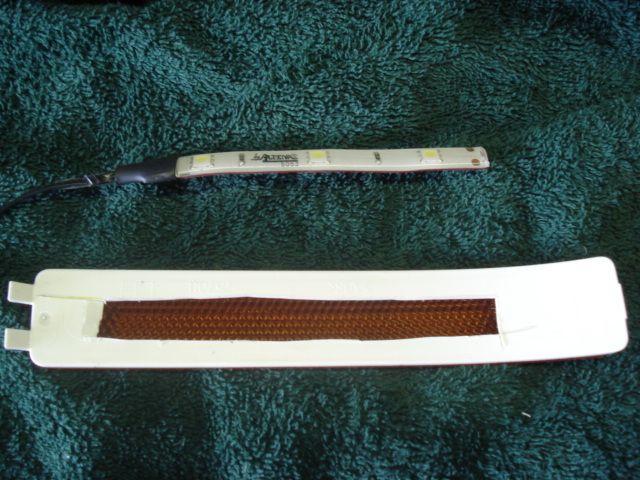 I then laid the LED strip on the backside of the reflector, centering it. I then traced the LED strip on backside of the reflector. Using a sharp utility knife you can slowly cut the plastic on the back side of the reflector along your marks. It's not very think and a couple passes and you should be through it. Once you have it cut out pull the piece of plastic out and discard it. This is what you'll have when your done. Next you lay the LED strip face down in the whole you cut out. I used a hot glue gun and ran a thin bead of hot glue all the way around it to seal it up. This is what it looks like glued in. Now all you have to do is wire it up.... Set the reflector on the mirror (don't snap it in) and mark where the wire needs to go through the mirror plastic under the reflector and drill a small hole in the mirror. Next pop the plastic cover off for where the Puddle light would be or pop the puddle light out. Right inside that cover you'll see a black and a Green/white stripped wire. Those are the wires that go to the rear facing LED turn light. Trim a small section of the insulation off the Green/White wire and connect the + from your front facing LED's to this wire. I recommend soldering them together. 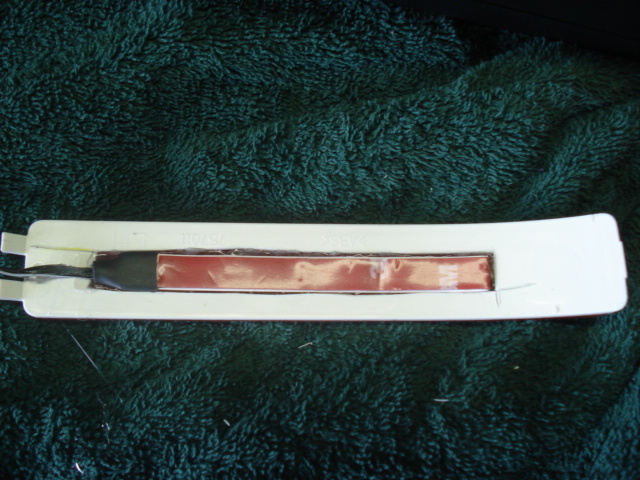 Wrap securely with electrical tape and move on to the black wire. Of course the black is the Negative for the LED lights. Tape it up and push it back in the puddle light hole and snap the puddle cover back on. Now I don't know if this video will transfer to this post correctly but this is what you end up with.... I think it's a great addition to the front of the truck and very functional. Click the image below and it should play or take you to my photobucket and play from there. Nicely done Jesse! I like it!!!! Agree it could have been done by ford, but that LED strip fits in there perfect. Really like it.